MY DEAR FATHER: This is Sir John Herschel's place. I came last night just at dusk…. This declaration to her father had special meaning for Maria Mitchell. A decade after achieving sudden fame in 1847 with her discovery of a “telescopic” comet and her subsequent receipt of a gold medal from the King of Denmark, Mitchell was touring England and the Continent. Bearing letters of introduction from Benjamin Silliman, founder of The American Journal of Science and Yale’s first chemistry professor, and Joseph Henry, the first chief executive of the recently established Smithsonian Institution, she had been welcomed, in the summer of 1857, to the Royal Observatory at Greenwich by the Astronomer Royal, Sir George Airy. But reception by Sir John Herschel, the eminent mathematician and astronomer, and his wife, Lady Margaret Herschel—significant in itself—had added importance for Mitchell, as it might lead to her meeting the woman she referred to as “the most learned woman in Europe,” Mary Somerville. Born on December 26, 1780 in Jedburgh, Scotland, Mary Fairfax Somerville was one of the most prominent scientific thinkers and writers of her time. Her translation in 1831 of Pierre-Simon Laplace’s, Mécanique Céleste, under the title The Mechanism of the Heavens, was instantly acclaimed, as was On the Connexion of the Physical Sciences (1834). Reviewing the latter work, the English theologian and historian of science William Whewell is said to have coined the term "scientist." Her Physical Geography (1848) established her as England’s first geographer, and in 1835, Mary Somerville and Sir John Herschel’s aunt, Caroline Herschel, had been elected to honorary membership in the Royal Astronomical Society, the first women to be so honored. American men of science did not know her, and there had been unpleasant passages between the savants of Europe and those of the United States which made my friends a little reluctant about giving me letters. Professor Henry offered to send me letters, and said that among them should be one to Mrs. Somerville; but when his package came, no such letter appeared, and I did not like to press the matter—indeed, after I had been in England I was not surprised at any amount of reluctance. They rarely asked to know my friends, and yet, if they were made known to them, they did their utmost. "So I went to Europe with no letter to Mrs. Somerville, and no letter to the Herschels. I was very soon domesticated with the Airys, and really felt my importance when I came to sleep in one of the round rooms of the Royal Observatory. I dared give no hint to the Airys that I wanted to know the Herschels, although they were intimate friends. …. But one fine day a letter came to Mrs. Airy from Lady Herschel, and she asked, 'Would not Miss Mitchell like to visit us?' Of course Miss Mitchell jumped at the chance! Mrs. Airy replied, and probably hinted that Miss Mitchell 'could be induced,' etc. "If the Airys were old friends of Mrs. Somerville, the Herschels were older. The Airys were just and kind to me; the Herschels were lavish…. She was seventy-seven years old, but appeared twenty years younger. She was not handsome, but her face was pleasing; the forehead low and broad; the eyes blue; the features so regular, that in a marble bust by Chantrey, …I had considered her handsome…. Mrs. Somerville's conversation was marked by great simplicity; it was rather of the familiar and chatty order, with no tendency to the essay style. She touched upon the recent discoveries in chemistry or the discovery of gold in California, of the nebulae, more and more of which she thought might be resolved, and yet that there might exist nebulous matters, such as compose the tails of comets, of the satellites, of the planets, the last of which she thought had other uses than as subordinates. She spoke with disapprobation of Dr. Whewell's attempt to prove that our planet was the only one inhabited by reasoning beings; she believed that a higher order of beings than ourselves might people them. On subsequent visits there were many questions from Mrs. Somerville in regard to the progress of science in America. She regretted, she said, that she knew so little of what was done in our country…. She asked after Professor Peirce, whom she considered a great mathematician, and of the Bonds, of Cambridge. She was much interested in their photography of the stars, and said it had never been done in Europe. At that time photography was but just applied to the stars. I had carried to the Royal Astronomical Society the first successful photograph of a star. It was that of Mizar and Alcor, in the Great Bear. The inscription on the Vassar bust. Mary Somerville continued her prodigious work, publishing Molecular and Microscopic Science in 1869. In October of that year the four inductees at the centennial of the American Philosophical Society were two Americans and two Britons: Elizabeth Agassiz, Maria Mitchell, Mary Somerville, and Charles Darwin. Somerville died in Naples in 1872. 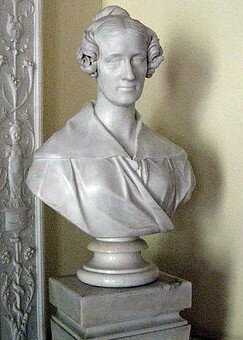 Mitchell placed the Somerville bust in the Clock and Chronograph Room in the Observatory. Maria Mitchell went abroad again in the summer of 1873. She visited the government observatory in Pulkova, Russia, and in late August she visited the Irish activist and feminist Frances Power Cobbe in London, wishing to deliver a letter from their mutual friend Julia Ward Howe. “I was delighted to find,” she wrote, “that she had been an intimate friend of Mrs. Somerville; had corresponded with her for years, and had a letter from her after she was ninety-two years of age, when she was reading Quaternions for amusement.... I asked her how I could get a photograph of Mrs. Somerville, and she said they could not be bought. 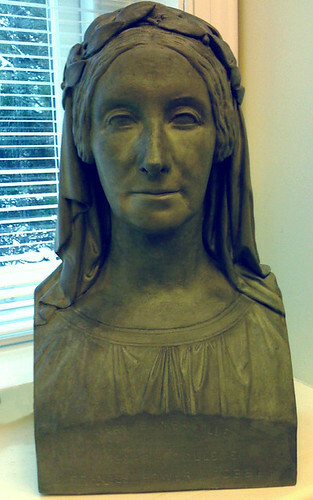 She told me, without any hint from me, that she would give Vassar College a plaster cast of the bust of Mrs. Somerville." 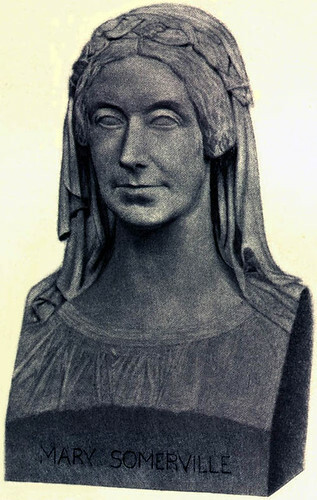 The plaster cast that Frances Power Cobbe subsequently sent to Vassar is of MacDonald’s 1844 bust, which Somerville’s daughter Martha declared was—along with a crayon drawing done in 1848 by James Swinton—“by far the best” of the many likenesses done of her mother. During her lifetime it occupied a prominent place in Maria Mitchell’s parlor in the observatory but in time was relegated to a stairwell in the building. 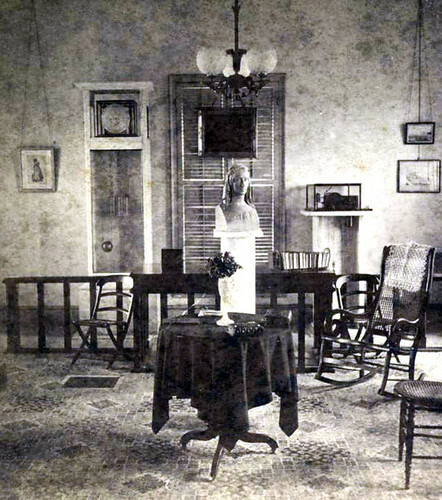 When re-discovered by Vassar’s historian, Elizabeth Daniels, who had an office in Mitchell’s 1st floor parlor before the observatory’s renovation in 2009, the bust was lying on the earth floor of a small closet. Now restored, it has returned to a rightful place of honor in the Maria Mitchell Observatory. Phebe Mitchell Kendall, ed., Maria Mitchell Life, Letters, and Journals, Boston, 1896. Martha Charters Somerville, ed., Personal Recollections from Early Life to Old Age of Mary Somerville, Boston, 1876.